The White House has been reaching out to political allies and conservative activist groups to discuss preparations for an ailing Supreme Court Justice Ruth Bader Ginsburg's possible death or departure from the bench, according to Politico. 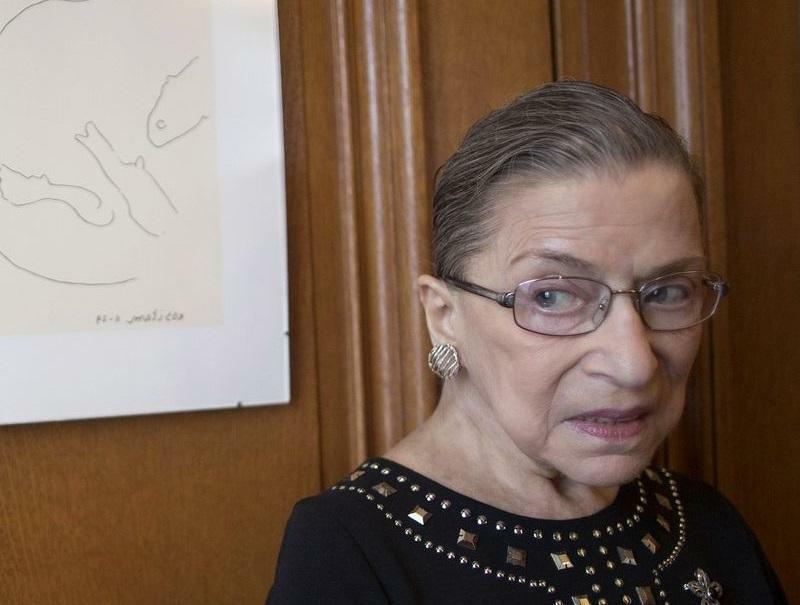 Ginsburg has been absent from Supreme Court arguments this week following the removal of two malignant cancerous growths from her left lung on Dec. 21. According to a source familiar with the discussions, the White House "is taking the temperature on possible short-list candidates, reaching out to key stakeholders, and just making sure that people are informed on the process. They're doing it very quietly, of course, because the idea is not to be opportunistic, but just to be prepared so we aren't caught flat-footed." The Supreme Court announced that Ginsburg had a pulmonary lobectomy, and that there was "no evidence of any remaining disease" post surgery. That said, her absence from the bench for the first time in more than 25 years is notable. The oldest Supreme Court Justice has battled cancer twice in the past, once in 1999 and then in 2009 when she underwent surgery for pancreatic cancer - neither of which kept her away from court. On Monday, Chief Justice John Roberts said that she was "unable to be present" but would participate in oral arguments by reading briefs, filings and a transcript of the session. Ginsburg's departure from the Court would pave the way for Trump to nominate a third Supreme Court Justice - the most in one presidential term since Ronald Reagan nominated three judges during his second term, notes Politico. "It would be a brutal confirmation," said the Heritage Foundation's John Malcom, who heads up the Meese Center for Legal and Judicial Studies. "The first two were not easy at all, but this would be much harder in this respect: When Neil Gorsuch was the nominee, you were replacing a conservative with a conservative. With Kavanaugh, you were replacing the perennial swing voter, who more times than not sided with the so-called conservative wing, so that slightly solidified the conservative wing." "But if you are replacing Justice Ginsburg with a Trump appointee, that would be akin to replacing Thurgood Marshall with Clarence Thomas," said Malcom. "It would mark a large shift in the direction of the court." The White House is urging outside allies to be prepared for another bruising confirmation battle should Ginsberg’s health take a sudden turn for the worse, according to four sources with knowledge of the overtures. Outside groups, led by the Federalist Society and the Judicial Crisis Network, played a leading role in helping to confirm Kavanaugh and, before that, Justice Neil Gorsuch. Supreme Court appointments are for life, and replacements can only occur upon the death or retirement of a judge. If a judge cannot perform their duties, Congress has the option to impeach. In December, the vehemently anti-Trump- Ginsburg told an audience that she "will do this job as long as I can do it full steam." During the heat of the 2016 US election, Ginsburg made shockwaves when she told the New York Times that should President Trump become President, it would be time to move to New Zealand, stating "I can’t imagine what the country would be with Donald Trump as our president," adding "For the country, it could be four years. For the court, it could be — I don’t even want to contemplate that." The comments led many to suggest Ginsburg would need to recuse herself from any decisions involving Trump, with even the Washington Post noting that some "wondered what impact this might have on Ginsburg's decision to hear cases involving Trump. - If there's a redo of Bush v. Gore, how does Ginsburg not recuse herself, given her Trump comments?" Trump fired back, telling The Times "I think it’s highly inappropriate that a United States Supreme Court judge gets involved in a political campaign, frankly." He also tweeted: "Justice Ginsburg of the U.S. Supreme Court has embarrassed all by making very dumb political statements about me. Her mind is shot - resign!"